Source: William Chappell, The Ballad Literature and Popular Music of the Olden Time. London: Chappell & Co., 1859, pp. 227-233. 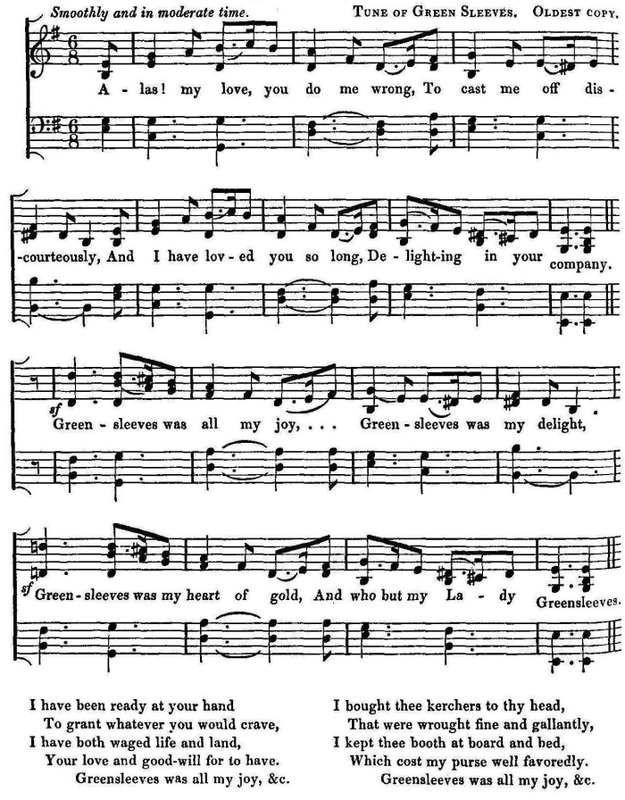 Green Sleeves, or Which nobody can deny, has been a favorite tune, from the time of Elizabeth to the present day; and is still frequently to be heard in the streets of London to songs with the old burden, “Which nobody can deny.” It Will also be recognised as the air of Christmas comes but once a year, and many mother merry ditty. “And set our credits to the tune of Greene Sleeves.”—The Loyal Subject, by Beaumont and Fletcher. Falstaff.— "Let the sky rain potatoes! let it thunder to the tune of Green Sleeves, hail kissing comfits, and snow eringoes, let there come a tempest of provocation, I will shelter me here.” (Embracing her.) — Merry Wives of Windsor, act v., sc. 5. “Mrs. Ford.— "I shall think the worse of fat men, as long as I have an eye to make difference of men’s liking. And yet he would not swear; praised women’s modesty; and gave such orderly and well-behaved reproof to all uncomeliness, that I would have sworn his disposition would have gone to the truth of his words: but they do no more adhere and keep pace together, than the Hundredth Psalm to the tune of Green Sleeves.”— Merry Wives of Windsor, act ii., sc. 1. As the ballad of The Lord of Lorne and the False Steward, which was entered on the 6th October, 1580, was sung to the tune of Green Sleeves, it would appear that Green Sleeves must be a tune of Henry’s reign. Copies of The Lord of Lorne are in the Pepys Collection (i. 494), and the Roxburghe (i. 222). Within twelve days of the first entry of Green Sleeves it was converted to a pious use, and we have, “Greene Sleves moralised to the Scripture, declaring the manifold benefites and blessings of God bestowed on sinful man;” and on the fifteenth day Edward White had “tollerated unto him by Mr. Watkins, a ballad intituled Greene Sleeves and Countenance, in Countenance is Greene Sleeves.” By the expression “tolerated” instead of “licensed,” we may infer it to have been of questionable propriety. Great, therefore, was the popularity of the ballad immediately after its publication, and this may be attributed rather to the merry swing of the tune, than to the words, which are neither remarkable for novelty of subject, nor for its treatment. Yellow Sleeves come to decaie. The conspirators were treated with very little consideration by the ballad-monger in having their exit chaunted to a merry tune, instead of the usual lamentation, to the hanging-tune of Fortune my foe. The song of York for my money is on a match at archery between the Yorkshire and the Cumberland men, backed by the Earls of Essex and Cumberland, which Elderton went to see, and was delighted with the city and with his reception; especially by the hospitality of Alderman Maitby of York. Copies will be found in the Roxburghe Collection, i. 1, and Evans’ Old Ballads, i. 20,. It begins, “As I come thorow the North countrey,” and is refered to in Heywood’s King Edward IV., 1600. In Mr. Payne Collier’s Old Ballads, printed for the Percy Society, there is one Queen Elizabeth at Tilbury Fort (written shortly anterior to the destruction of the Spanish Armada) to the tune of Triumph and Joy. The name of the air is probably derived from a ballad which was entered on the Stationers’ books in 1581, of “ The Triumpe shewed before the Queene and the French Embassadors,” who preceded the arrival of the Duke of Anjon, and for whose entertainment jousts and triumphs were held. The tune for this ballad is not named in the entry at Stationers’ Hall, but if a copy should be found, I imagine it will prove also to have been written to Green Sleeves, from the metre, and the date coinciding with the period of its great popularity. Richard Jones, to whom Green Sleeves was first licensed, was also the printer of A Handefull of Pleasant Delites, 1584, in which a copy of the ballad will be found. Also in Ellis’ Specimens, ii. 394, (1803). A few verses are subjoined, as affording an insight into the dress and manners of an age with which we cannot be too well acquainted. The tune is contained in several of Dowland’s lute manuscripts; in William Ballet’s Lute Book; in Sir John Hawkins’ transcripts of virginal music; in The Dancing Master; The Beggar’s Opera; and in many other books. As the second part differs in the oldest copies, from others of later date, both versions are subjoined. The first is from William Ballet’s Lute Book compared with another in Sir John Hawkins’ transcripts of virginal music; both having the older second part. Greensleeves was all my joy, &c.
It was also called The Brewer, or Old Noll, the Brewer of Huntingdon, from a satirical song about Oliver Cromwell, which is to be found in The Antidote to Melancholy, 1661, entitled “The Brewer, a ballad made in the year 1657, to the tune of The Blacksmith;” also in Wit and Drollery, Jovial Poems, 1661. And let his health go round. There is no apparent connection between the subject of the first and that of the remaining stanzas; and although the first may have been the burden of an older song, it bears no indication of having refered to the clergy of any denomination. There is scarcely a collection of old English songs in which at least one may not be found to the tune of Green Sleeves. In the West of England it is still sung at harvest-homes to a song beginning, “A pie sat on a pear-tree top;” and at the Maypole still remaining at Ansty, near Blandford, the villagers still dance annually round it to this tune. The following “Carol for New Year’s Day, to the tune of Green Sleeves,” is from a black-letter collection printed in 1642, of which the only copy I have seen is in the Ashmolean Library, Oxford. 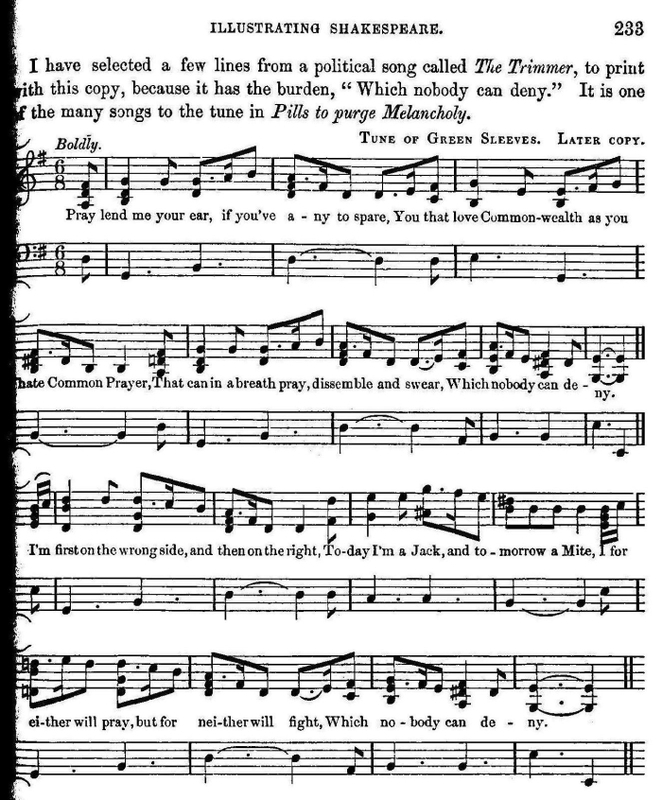 The following version of the tune, from The Beggars’ Opera, 1728, is that now best known. I have not found any lute or virginal copy which had this second part. The earliest authority for it is The Dancing Master, 1686, and it may have been altered to suit the violin, as the older second part is rather low, and less effective, for the instrument. I have selected a few lines from a political song called The Trimmer, to print with this copy, because it has the burden," Which nobody can deny." It is one of the many songs to the tune in Pills to purge Melancholy. For God may suffer for a time. And what do you think it is about ?